I have never been keen on artworks made of cardboard. It seems strange to me quite how often somebody gets some cardboard boxes together, does something minimal to them and then tells you it is art. That is all very well when you are eight, or, at a push, twelve, but if you are older than that, I always feel like saying, “why not get some decent materials and do it properly?” So, when I saw a flyer in Paris for an exhibition that featured quite a large amount of cardboard and, what is more, it looked interesting, I just had to go. I took the metro out to Riquet which is quite some way out from the centre in the 19th arrondissement and arrived at 104 (Cent Quatre). Set up in 2010, Cent Quatre is a huge and also hugely entertaining community arts complex that seems to have every conceivable artistic activity going on under the rather elegant steel and glass roof. It was formerly a municipal morgue but now everybody seems very much alive; there are dancers practicing their routines, children playing, people skateboarding, artists’ studios, a book exchange, a bookshop, several eateries, an antique shop, photographic exhibitions and on the day I visited a labyrinth made exclusively of cardboard. 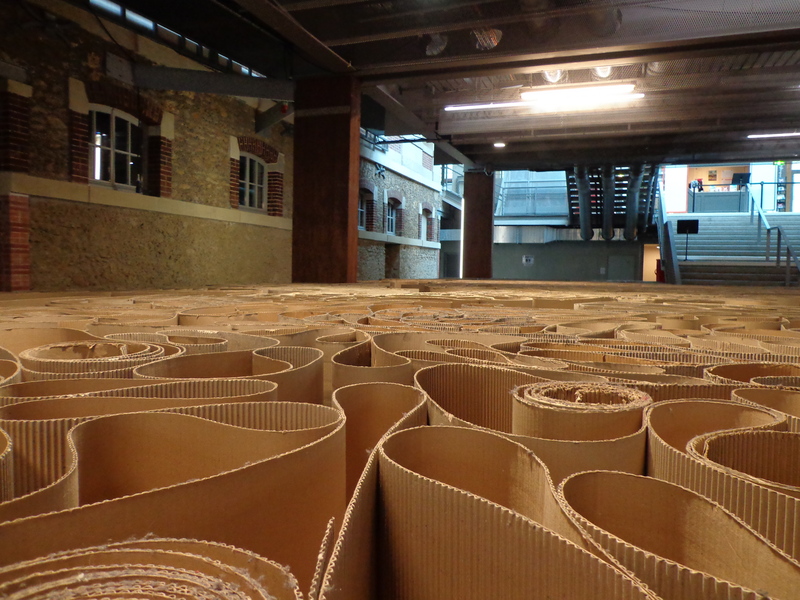 It was as simple as that: rolls of corrugated cardboard had been loosely unfurled so that they retained a coiled appearance and formed undulating waves through which you could make out paths,which, as in all good labyrinths, led you to the centre. The installation is the work of Michelangelo Pistoletto, who is eighty and is a leading member of the Italian movement, l’Arte Povera, a movement that was started in the 1960s. Ironically, seeing its members claim to value simplicity, when they come to explain its principles, they favour very long, very wordy sentences and few if any paragraphs. With my poor Italian and the help of Google translate I took from the movement’s website that works are “characterized by the use of simple and natural materials that are evidenced by its banality and poverty, as is the case with plants, food, paper, felt, metal, earth. These materials are used in order to overcome the distinctions between art and everyday life, between nature and culture.” There was a lot more but that seemed to be the gist. Certainly Pistoletto’s cardboard work was quite unlike other gallery exhibits. 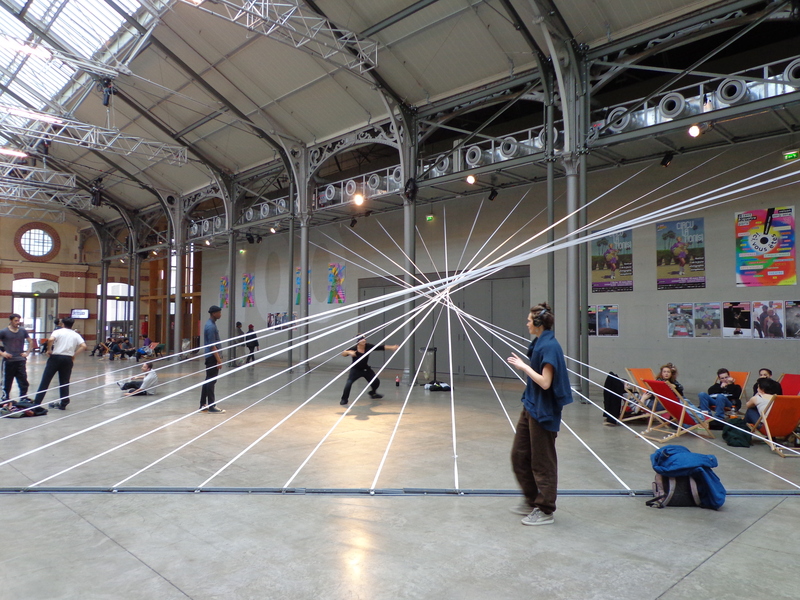 What I found interesting was that it was that it had been organised rather than made. There were no joins, no supports, no other materials, no cut-outs, no mark making. It was simply unfurled rolls of cardboard. It seemed more akin to land art than to anything else, as if material from the immediate environment had simply been rearranged. Far from having notices not to touch, touching was unavoidable. The cardboard walls were about shoulder height but the paths through it quite narrow, so it felt somewhat like pushing through undergrowth. It was fun and I imagine small children would adore it. In some places the cardboard looked a bit worse for wear, where people must have fallen against it but it didn’t matter. A path led you to the centre where, on the inside of cardboard arranged in a circle, there was one of Pistoletto’s trademark mirrored sculptures. 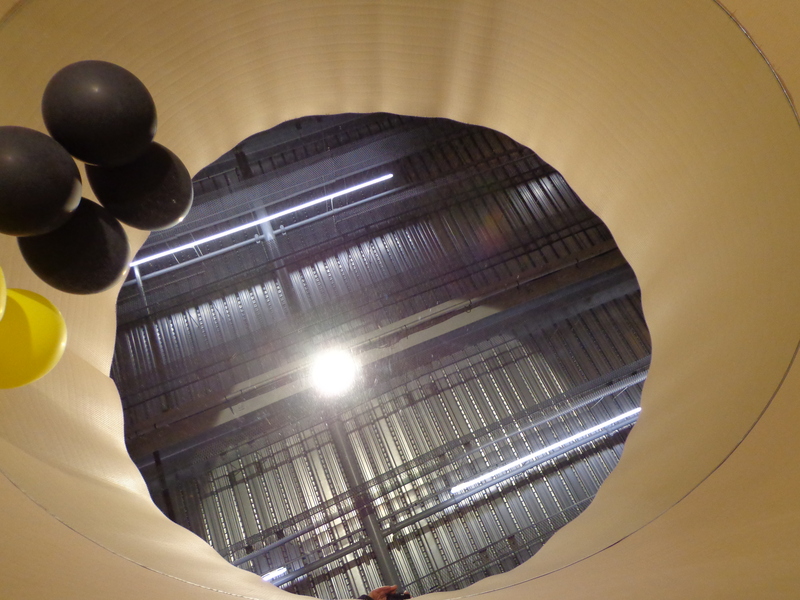 Looking down over the cardboard barrier which surrounded it, it appeared almost like a deep pool in the floor, and as the cardboard wobbled, it was hard not to fear falling into it. The pool was essential, it gave the labyrinth a purpose, but it was the cardboard that I found so interesting. Just as in the old adage, there is no unsuitable weather, only unsuitable clothes, I realized that in art there are no unsuitable materials. In the right hands good art can be produced from anything.